Many consider one-to-one laptop computing empowering and exciting but this type of educational equipping also raises questions about how teachers can develop and learn professionally to meet challenging and changing classroom conditions, in situ. In this paper we draw illustrative findings from a study of high school English teachers during the implementation of an ubiquitous mobile learning innovation. Using multiple profiles generated from the Concerns-Based Adoption Model (CBAM) we exemplify how we identified and supported teachers’ diminishing and increasing operational and pedagogical issues through an iterative co-generated action-planning programme that supplemented generic departmental and school-wide workshops and seminars. We end with a discussion of the practical implications for teachers in moving towards student-centred learning and the limited utility of one-size-fits-all technical training. We also mention the limitations of focusing on individual competence in digital tool use in teacher professional learning contexts. Towndrow, P.A. & Wan, F. (2012). Professional learning during a one-to-one laptop innovation. 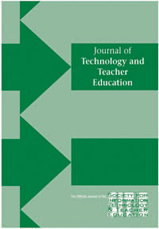 Journal of Technology and Teacher Education, 20 (3), 331-355. Waynesville, NC USA: Society for Information Technology & Teacher Education. Retrieved April 26, 2019 from https://www.learntechlib.org/primary/p/37132/. Ajayi, L. (2009). English as a second language learners’ exploration of multimodal texts in a junior high school. Journal of Adolescent & Adult Literacy, 52(7), 585-595. Atkinson, J. W. (1964). An introduction to motivation. New Jersey: D. Van nostrand. Baker, E. L., Gearhart, M., & Herman, J. L. (1990). Apple classrooms of tomorrow (ACOT): Evaluation study - First and second year findings. California: Apple Computer. Bebell, D. (2005). Technology promoting student excellence: An investigation of the first year of 1:1 computing in New Hampshire middle schools. Boston: Boston College. Boreham, N. (2004). A theory of collective competence: Challenging the neoliberal individualisation of performance at work. British Journal of Educational Studies, 52(1), 5-17. Burns, K., & Polman, J. (2006). The impact of ubiquitous wireless computers in the internet age: how middle school teachers adapted to the technology in the initial stages of implementation. Journal of Technology and Teacher Education, 14(2), 363-385. Donovan, L., & Green, T. (2010). One-to-one computing in teacher education: Faculty concerns and implications for teacher educators. Journal of Digital Learning in Teacher Education, 26(4), 140-148. Elmore, R. F. (2006). Leadership as the practice of improvement (preliminary draft). Paper presented at the international Conference on international Perspectives on School leadership for Systematic improvement, hSBC headquarters, london. Fox, M. (2006). Bridging the digital divide. International Journal of Learning, 13(5), 43-55. Garthwait, A., & Weller, H. G. (2005). A year in the life: Two seventh grade teachers implement one-to-one computing. Journal of Research on Technology in Education, 37(4), 361-377. Glaser, B., & Strauss, A. L. (1967). The discovery of grounded theory: Strategies for qualitative research. Hawthorne, new York: Aldine de Gruyter. Hall, G. E., & Hord, S. M. (2006). Implementing change: Patterns, principles, and potholes. Boston: Allyn and Bacon. Hall, G. E., George, A. A., & Rutherford, W. L. (1979). Measuring stages of concern about the innovation: A manual for use of the SoC questionnaire (2nd ed.). Research and development Center For Teacher education, University of Texas at Austin. Hall, G. E., & Loucks, S. (1978). Teacher concerns as a basis for facilitating and personalizing staff development. Teachers College Record, 80(1), 36-53. Holcomb, L. B. (2009). Results & Lessons learned from one-to-one laptop initiatives: A collective review. TechTrends, 53(6), 49-55. Jukes, I., McCain, T., & Crockett, L. (2010). Understanding the digital generation: Teaching and learning in the new digital landscape. Kelowna, BC: Corwin. Kennedy, A. (2005). Models of continuing professional development: A framework for analysis. Journal of In-service education, 31(2), 235-250. Khambari, M. N. M., Moses, P., & Wong, S. L. (2009). Laptop ownership and use among educators: reflections from school teachers in Malaysia. International Journal of Instruction, 2(2), 47-72. Lei, J., Conway, P. F., & Zhao, Y. (2008). The digital pencil: One-to-one computing for children. New York: lawrence erlbaum Associates. Livingston, P. (2009). 1-to-1 learning: Laptop programs that work (2nd ed.). Washington, dC: international Society of Technology in education. McGrail, E. (2006). “it’s a double-edged sword, this technology business”: Secondary english teachers’ perspectives on a schoolwide laptop technology initiative. Teachers College Record, 108(6), 1055-1079. McGrail, E. (2007). Challenges to teacher control in the english laptop classroom. Georgia Educational Researcher, 5(1), 1-19. McKinnon, D. H., & Nolan, P. C. J. (1989). Using computers in education: A concerns-based approach to professional development for teachers. Australian Journal of Educational Technology, 5(2), 113-131. Mcnamara, C. (1999). General guidelines for conducting interviews. Retrieved January 17, 2010, from http://www.mapnp.org/library/evaluatn/intrview.htm Mertens, D. M. (1998). Research methods in education and psychology: Integrating diversity with quantitative and qualitative approaches. Thousand oaks, California: Sage Publications. Moersch, C. (1995). Levels of technology implementation (loTi): A framework for measuring classroom technology use. Learning and Leading with Technology, 23(4), 40-42. Mouza, C., Cavalier, A., & Nadolny, L. (2008). Implementation and outcomes of a laptop initiative in career and technical high school education. Journal of Educational Computing Research, 38(4), 411-452. Newhouse, P. (1999). Examining how teachers adjust to the availability of portable computers. Australian Journal of Educational Technology, 15(2), 148166. Owen, A., Farsaii, S., Knezek, G., & Christensen, R. (2005-2006). Teaching in the one-to-one classroom: it’s not about laptops, it’s about empowerment! Learning and Leading with Technology, 33(4), 12-16. Prensky, M. (2010). Teaching digital natives: Partnering for real learning. Thousand oaks, California: Corwin. Rogers, E. M. (1995). The diffusion of innovations (4th ed.). New York: Free Press. Roth, W.-M., & Tobin, K. G. (2002). At the elbow of another: Learning to teach by coteaching. New York: Peter lang. Sclater, J., Sicoly, F., Abrami, P. C., & Wade, C. A. (2006). Ubiquitous technology integration in Canadian public schools: Year one study. Canadian Journal of Learning and Technology, 32(1). Towndrow, P. A., & Vaish, V. (2009). Wireless laptops in english classrooms: A SwoT analysis from Singapore. Educational Media International, 46(3), 207-221. Wiggins, G. P., & McTighe, J. (2005). Understanding by design (2nd ed.). Alexandria, VA: Association for Supervision and Curriculum development. Warschauer, M. (2006). Laptops and literacy: Learning in the wireless classroom. New York: Teachers College Press.